Quickly switch between batch drying and continuous drying. 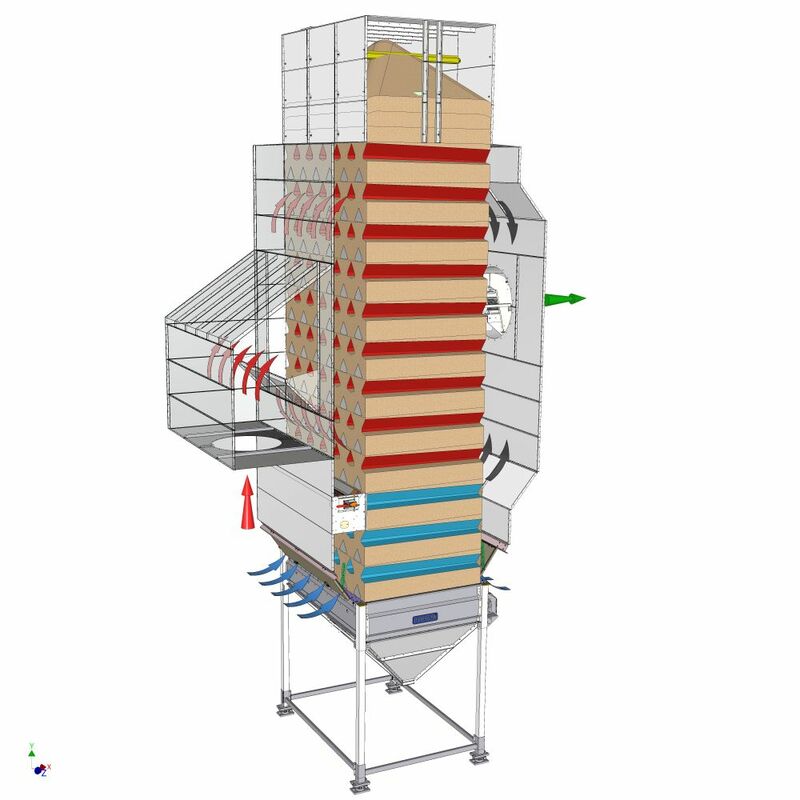 Tornum TF is the flexible dryer where you can best match the grain and quantity, while retaining the quality. is sized according to the size of the dryer and the heat source. A low-pressure dryer generates significantly less dust in the area around the dryer than a so-called high-pressure dryer, which also eliminates the risk of condensation in the grain zone, pipes and elevators. When starting continuous drying, there is always a “starting pause” before the dryer starts working independently. The advantage of continuous drying grows with the volume of grain. In the Continuous drying mode, you can control the dryer using the Tornum IDC system, which measures the moisture content of the incoming and outgoing grain. For smaller volumes or for grains to be dried at a low temperature over a long period of time, choose the Batch drying mode. In Batch drying mode, control is based on either weight, time or temperature, depending on what works best for you. – TF can be easily switched between continuous drying and batch drying using motor-controlled shutters that are controlled via Tornum’s control system, for example. This allows the dryer to be ready in an instant after completing continuous drying. – The dryer is emptied down to the last grain because there are no interior surfaces that can retain any material. This makes cleaning and decontamination easier when switching to different grain types. – TF can be equipped with an optional fan type based on your wishes; axial fans or dust-separating fans of the type CAC or EDS when there are particular requirements for the surrounding area. All of the alternatives can be equipped with sound dampers. – TF can be controlled in continuous mode using Tornum’s *IDC system or in batch drying mode via the selected time, weight or temperature control. *For at least 12 sections. – TF can be run with an optional heat source entirely to your wishes and situation, designed by Tornum according to LBK’s recommendations. Indirect oil burners, gas burners for natural gas or liquified petroleum, direct heat from pellets or flakes, hot water batteries, steam batteries or electric batteries are the most common heat sources.